The old theater adage is “don’t work with children or animals.” In this case, the creations of the Handspring Puppet Company makes that doubly true when working with mechanical animals. It doesn’t take long for the audience to get swept up in the beauty and pageantry of the magnificent horses in the moving piece, “War Horse.” Though originally written as a children’s book, this epic tale of love and devotion gets a bit too intense for the younger set as war, cruelty to animals (and humans) and a lot of blood and horror are all part of the story. Fortunately the play is epic due to the puppetry and special effects more than the story line and it’s just right for the older theatre goer. Alex Morf leads the way as Albert, a young man who takes to a young foal that his father, in a drunken stupor, has bid too highly on at an auction and brings home. Brian Keane as the tyrannical father and Angela Reed as the mother bicker about the foolish purchase and how the rent will be paid while Albert sees nothing but the young horse he has called Joey. At the insistence of his father, Albert trains Joey to pull a plow even though he is truly a thoroughbred. This comes in handy for the grown up horse after he is “drafted” by the British army in the Great War and makes himself useful by pulling artillery. Even when captured by the Germans, Joey saves himself from the front lines in similar fashion. Original music is by Adrian Sutton and the “song maker” is John Tams, wonderfully performed throughout by Nathan Koci and John Milosich. But the real stars on stage are the wonderful “manipulators” who handle the horses throughout the story. Although you see two pair of feet under the intricate horse frames made of various materials and see the man always alongside the horse creating the head movements, you soon get lost in the magic of what these creatures can actually do as they work their way into our hearts and minds. Toby Sedgwick is given credit for the movement and horse “choreography” and his work is outstanding. The movements as they shake their heads or tails, take a bucket of oats and even the realistic horse snorts and whinnies are right on the mark. And Adrian Kohler and Basil Jones are the masterminds behind the creation of these magnificent beasts. A swath of material hanging over the backstage area becomes the background for projections to indicate location, time and other material necessary to moving the story along. The sounds, lights and other special effects are nothing short of remarkable. The transition of Joey from foal to horse is simply incredible, for instance, as is the slow motion death of the captain who is riding Joey into battle (told you it wasn’t really for the kids). 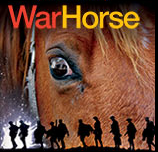 So “War Horse” becomes more a spectacle than a play. The story is fine and you can see where it would appeal to a younger set but the thing about this play is the sheer genius of the puppets and how real they become to an audience. So it’s a judgement call on bringing the children. The older ones will find it fascinating and probably appreciate the magic that happens while the younger ones may just get frightened by the story and the blasts of lights and gunfire. “War Horse” is truly a wonder to behold. It’s a definite tissue moment at the finale as tears well up- even at the end of the startling first act finale. It’s a theatrical event that you won’t want to miss, however and one you may not believe until you actually see it. “War Horse” plays at the Fox Theatre through March 24th. Call MetroTix at 314-534-1111 for tickets. This entry was posted on March 15, 2013 at 9:43 pm03 and is filed under Uncategorized. You can follow any responses to this entry through the RSS 2.0 feed. You can leave a response, or trackback from your own site.